The Maldives Hurawalhi Island Resort hasn’t lowered the bar. 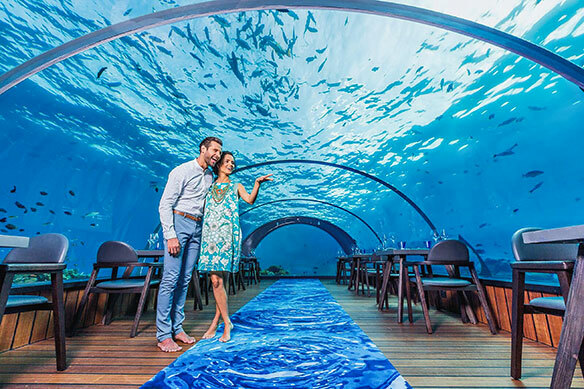 The island retreat has three restaurants, among them 5.8 Undersea Restaurant, billed as the “world’s largest, all-glass undersea restaurant,” and is 5.8 metres beneath the sea surface, hence its name. Guests reach the restaurant – which serves dishes under the watchful eye of a Michelin-rated chef – by a spiral staircase, says Nina Fleischmann-Torosyan, the resort’s director of sales and marketing. Divers carefully clean the exterior twice a day, ensuring great views for diners. And, says Fleischmann-Torosyan, that sort of innovation has helped Hurawalhi build up a weighty presence in the Maldives, with the company having 11 properties in the sprawling destination. The properties range from three stars to luxury and some are family oriented, while others are for adults alone; and some are particularly geared for divers, with the Maldives popular with the underwater exploration set, thanks to its calm seas and tropical marine life. in the Aquarium Restau-rant, and three bars. Both the Aquarium Bar and the Champagne Pavilion are over water. The property is a 40-minute seaplane ride from the Maldives capital of Male. Meanwhile, Fleischmann-Torosyan said another resort is in the works for her employer, with Kudadoo Private Island to open in February. It will be a seven-minute speedboat ride away from Hurawalhi Island Resort. Guests will find 15 residences, all of which will be over the water and have butler service. Those interested in vacationing on Kudadoo can rent one or more residences, with groups able to rent them all, she reports. The Maldives has built a following in Europe, thanks to its calm waters, watersports opportunities and “nice beaches are everywhere,” Fleischmann-Torosyan says. Many visitors decide to vacation there after exploring India. Hurawalhi prides itself on its casual ambience, which Fleischmann-Torosyan saying is “sort of a no shoes, no news” atmosphere. Resort general managers don’t wear shoes, underscoring “that relaxation factor,” she says. Hurawalhi is taking steps to safeguard the Maldives’ environment, among other things planting coral in local waters, and the company has a marine biologist who familiarizes Maldives residents with conservation issues. The resort company also has its own water bottling plant, and all its resorts use solar energy, Fleischmann-Torosyan says. Hurawalhi works with both The Travel Network and New Wave Travel. More information can be found at www.hurawalhi.com .